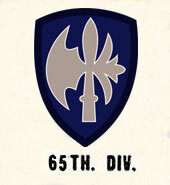 The 65th Infantry Division landed at Le Havre, France, 21 January 1945, and proceeded to Camp Lucky Strike, where training continued until 1 March, when the Division moved forward to relieve the 26th Infantry Division. First elements entered the line, 5 March 1945, and the Division as a whole took over aggressive defense of the sector along the Saar, from Orscholz to Wadgassen, on 8 March 1945. On 17 March, the Division attacked across the Saar, crossing the river at Dillingen and captured Saarlautern, 19 March, as Siegfried Line defenses cracked. Capturing Neunkirchen, 21 March 1945, the Division raced to the Rhine, crossed the river at Oppenheim, 30 March, and ran into heavy Germany resistance and counterattacks. Langensalza fell on 5 April, Struth on the 7th, and Neumarkt on the 22d. Continuing its advance against crumbling Nazi opposition, the Division crossed the Danube 4 miles below Regensburg, 26 April, took the city, 27 April, seized Passau, cross the Inn River, 4 May, and occupied Linz, Austria, on the 5th. Germans surrendered en masse. On 9 May, as hostilities officially ended in Europe, the troops of the 65th made contact with the Russians at Erlauf.